NASA's MESSENGER probe traveled for more than 6.5 years through space before it entered Mercury orbit in 2011. 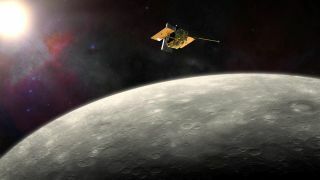 After NASA's Mercury Surface, Space Environment and Geochemistry Ranging (MESSENGER) mission ended in 2015, the crust of the solar system's innermost planet was thought to be roughly 22 miles (35 kilometers) thick. However, one scientist now disagrees. Michael Sori, from the University of Arizona's Lunar and Planetary Laboratory, believes that Mercury's crust is just 16 miles (26 km) thick and denser than aluminum. His new estimate supports the theory that the crust formed largely through volcanic activity. There are two basic kinds of isostasy: Pratt and Airy. Both invoke balancing the masses of various parts of a planet, but they go about it in different ways. Pratt isostasy posits that the density of a planet's crust varies from spot to spot, whereas Airy holds that crust depth depends heavily on topography. Sori set out to relate Mercury's density to its topography. Scientists had already constructed a topographic map using data collected by the Mercury-orbiting MESSENGER — the only probe ever to orbit the planet — but a map of density didn't exist. So Sori made his own, using data about the elements found on Mercury's surface. "We know what minerals usually form rocks, and we know what elements each of these minerals contain," Sori said in a statement. "We know the densities of each of these minerals. We add them all up, and we get a map of density." Pratt isostasy predicts that high-density minerals should be concentrated preferentially in craters and low-density minerals in mountains. But Sori found no such correlation, so he rejected the idea. That left Sori with Airy isostasy, a model that's been used to estimate Mercury's crustal thickness in the past. Mercury as seen through infrared, red and violet filters that capture wavelengths both visible and invisible to the human eye. An analogy may help draw a picture of what's going on: The tip of an iceberg is supported by a mass of ice that protrudes deep underwater. The iceberg contains the same mass as the water it displaces. Similarly, a mountain and its root will contain the same mass as the mantle material being displaced. In craters, the crust is thin, and the mantle is closer to the surface. A wedge of the planet containing a mountain would have the same mass as a wedge containing a crater. "These arguments work in two dimensions, but when you account for spherical geometry, the formula doesn't work out," Sori said. However, a formula developed by Isamu Matsuyama, also from the Lunar and Planetary Laboratory, and Douglas Hemingway from the University of California, does work for spherical bodies like planets. Instead of balancing the masses of the crust and mantle, it balances the pressure the crust exerts on the mantle, providing a more accurate estimate of crustal thickness. Sori used his density estimates and the Matsuyama-Hemingway model to calculate his new crust-thickness figure. Sori’s study, "A Thin, Dense Crust for Mercury" was published in the journal Earth and Planetary Science Letters this past May.